What should I do next on this webpage?? E-mail me at soccerbethtigger@yahoo.com or make a comment in the guestbook. Thanks! Pictures: Page 1|Page 2|Page 3|Page 4|Page 5|Page 6|Page 7--new!! "Monkey Business". (Season Premiere, Part 1 of 2) Mary tries to conceal her May-December romance with a pilot (Grant Goodeve), until he shows up at the Camden home; Kevin introduces his attractive new partner (Rachel Blanchard) to Lucy with explosive results. 7th Heaven News: Ashlee Simpson and Rachel Blanchard (Clueless) will be added onto the show as series regulars. 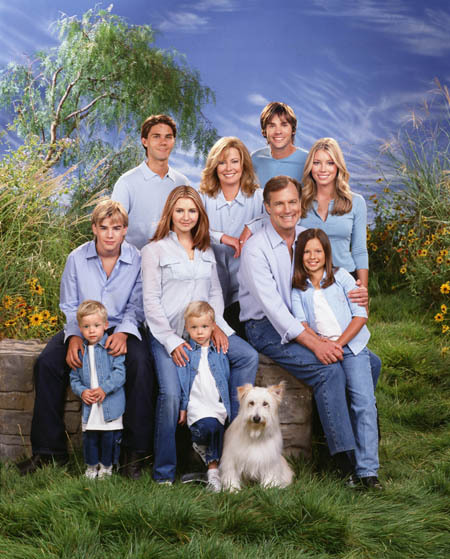 On July 31, 2002, 7th Heaven won Best Drama at the Family Television Awards. Congrats! The program will air on August 9th on ABC. To see the picture of Beverly Mitchell and Stephen Collins accepting the award, click here! Barry Watson, who plays Matt, has been diagonsed with Hodgkin's Disease. On behalf of all of the 7th Heaven fans, I would like to wish Barry a speedy recovery. Get well soon!! If you would like to learn more about what Hodgkin's Disease is, please click here. Webpage Updates and News: Hello! I finally put up the new season pictures that are released and other pictures from new episodes this season. Also, I updated the links page. Once the new season starts on Sept. 16, I will keep on updating the site EVERY week. So please keep on checking back! If you have any ideas on what I can do next on the website, please e-mail me or leave a message in the guestbook! Thank you!